It's the first week of January and you know what that means! That's right, all of the electronics that you received for Christmas are now rendered obsolete thanks to the new product announcements at the Consumer Electronics Show. This year I am working with the guys at G4 to bring you the latest in technology from the show floor. Tune in live January 7th and 8th at 4pm PST and 7pm Eastern on G4 TV (DirecTV 354) or tell your TiVo to record Consumer Electronics Show 2008 on both days to see what you will be looking for in your gadget future! You can also keep up with us online at http://www.g4tv.com/CES/ and of course via my Flickr page by just clicking on the photo here. 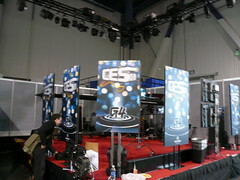 CES 2008 on G4 TV! This year I am working with the guys at G4 to bring you the latest in technology from the show floor. Tune in live January 7th and 8th at 4pm PST and 7pm Eastern on G4 TV (DirecTV 354 or tell your TiVo to record Consumer Electronics Show 2008 on both days to see what you will be looking for in your gadget future!